Checking my Google alerts for landscape architecture I came across this article in Chicago Business about Landscape Architect Peter Schaudt and his favorite designed spaces in the great city of Chiccago. It’s a terrific list with great information and insight into these spaces and this now makes this list sort of a must-see for any of us with interest in the subject if we visit the Windy City. I thought enough of this well-written article by Robert Sharoff(08/05/2013) to add all of the article here including the fantastic images from the article. The in-story links were added by me, along with the images just below, fantastic work by these gentlemen. Well, after reading this I have my work cut out for me on my next(don’t know when) trip to Chicago, but don’t expect me to go to a White Sox game. Cubs yes, White Sox-no. Yes, i’d love to go back to the Botanical Garden. Over the past 20 years, Peter Schaudt and Douglas Hoerr of Hoerr Schaudt Landscape Architects in Chicago have designed award-winning spaces for civic, commercial and institutional clients. These include everything from Soldier Field and Daley Plaza to Trump Tower, the Hyatt Center and Crate & Barrel stores. Mr. Schaudt, 54, grew up in Villa Park, where he still lives with his wife and two college-age children. 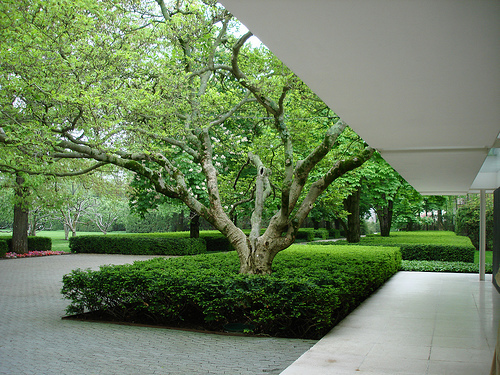 After graduating from Harvard University’s Graduate School of Design in 1984, he spent three years in Vermont working for the late Daniel Urban Kiley, regarded as the preeminent landscape architect of the midcentury modern era. We asked Mr. Schaudt for a list of his favorite Chicago gardens and landscapes. Here they are, in no particular order. “Columbus Park was Jens Jensen’s largest original commission for the Chicago park system. It’s about 140 acres on the border between the city and Oak Park. What I love about it is that it’s an abstraction of a natural Illinois prairie landscape with a system of cascades and limestone waterfalls that originally fed into a large lake. The lake got filled in when the Eisenhower Expressway was built in the 1950s, but the waterfalls remain and they’re glorious. Jensen’s disciple, Alfred Caldwell, used them as the inspiration for his famous lily pool in Lincoln Park. “There’s no sign and you enter it by driving to the back of Bluff City Cemetery, where there’s a tiny parking lot. Fens are marshy lowlands, and Bluff Spring—a 100-acre nature preserve—has a number of natural springs where 50-degree water bubbles up year-round. In the winter, there are clouds of steam over the fen. “The Riverwalk is Chicago’s High Line—a blighted 19th- century industrial corridor now being reborn as a people-friendly park. It’s not formal at all. It widens and narrows and there are a lot of little landscaping episodes along the way like curving benches, cafes, a fountain and a memorial or two. “Frederick Law Olmsted was a genius at illusion—those endless vistas he creates that twist slightly at the end and leave you wondering what’s around the next bend. Washington Park is just under 400 acres, with about half of it devoted to an enormous oval meadow where Olmsted specified that herds of sheep be kept to keep the vegetation at a manageable level. “The square, which consists of a central market hall encircled by four tiny colonnaded apartment buildings, is high Victorian urban infrastructure. I love the scale and the classical details, which are intimate to the point of miniaturization by today’s standards. Those curving apartment buildings seem like something you’d see in Florence. The Puerta del Perdón leads into the picturesque Patio de los Naranjos in Córdoba, planted with orange-trees and palms, where the ablutions prescribed by Islamic law were performed. Mosque and Court of Oranges in Cordoba, Spain ca12th C.